The following article is a very preliminary draft of one that will appear in Left Business Observer #118, forthcoming in April 2087. Part one, though not labeled as such, is on this site here. There are also several of Doug Henwood's radio shows covering this material on the radio page. Pity the poor stock market: it needs a new fix almost every day or it just lapses into a fainting spell. Graphed nearby is the U.S. market, as personified by the S&P 500 index, since the current financial crisis broke out last August. 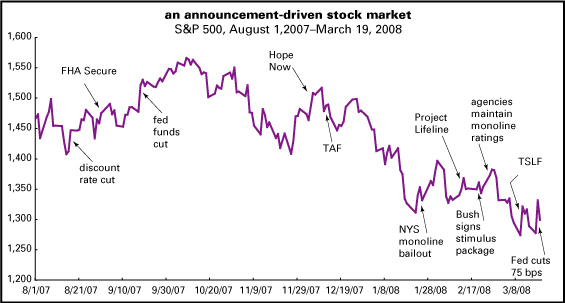 Crucial events are marked on the chartFed interest rate cuts, announcements of government programs (FHA Secure, Project Lifeline, Hope Now), Fed emergency loan schemes (Term Auction Facility, Term Securities Lending Facility), actions to boost the fortunes of the so-called “monoline” bond insurers (a bailout organized by New York State, maintenace of their shaky credit ratings), etc. As Merrill Lynch’s chief economist David Rosenberg (from whom we borrowed the list, and updated it) pointed out in a March 14 research note, these announcements have given the stock market a big boost for a day, maybe twoonly to be reversed as the euphoria wears off. The stock market was up a total of 22% on the announcement days (adding together all the daily gains). Problem is that on the days there wasn’t an announcementdays that were more than ten times as frequent as announcement daysthe market’s been down a cumulative 33%. So all the schemes have done little to keep the market from fallingthough presumably it would have been worse without the press release machinery working. The latest announcement boost was the Federal Reserve’s interest rate cut on March 18. It was entirely expectedless than the market had hoped for in fact, and accompanied by some harsher words on inflation than Fed watchers had predictedbut it still made traders and investors feel good for a few hours. That latest cut brought the real fed funds ratethe interest rate at which banks lend each other money overnight, the most sensitive indicator of Fed policy, less the inflation ratefirmly below 0. 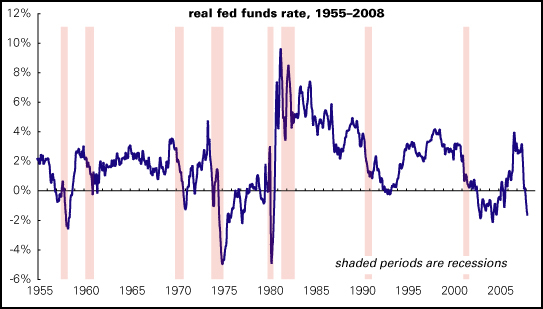 As the graph below shows, sub-zero funds rates are unusual, especially so early in what is presumably a recession. So far, all the interest rate cuts and extraordinary lending facilities and the rest haven’t turned things around. Although it’s not falling apart, the U.S. economy looks to be weakening steadily. Leading indicators so far do not suggest that it’s going down the drain, but there’s still no bottom in sight either. The most astonishing announcement of all doesn’t appear on the graph: the Bear Stearns rescue, if you can call the essential liquidation of an 85-year-old firm a rescue. That didn’t have all that measurable an effect on the stock market, which just meandered gently about on the day of the movenothing like the strong upsurge on the following day, when the Fed did somewhat less than what was expected of it. But it did attract lots of broad attention, even from people who normally don’t pay much attention to Wall Street. Was it necessary? And what does it mean? But if you think the risks of throwing millions out of work to make a political point aren’t worth it, then some sort of bailout of Bear was necessary. The firm wasn’t all that big (and the past tense is warranted, because it’s going to be absorbed by JP Morgan Chase), but it was connected to scores of other institutions, like banks and hedge funds. If Bear had gone under, it would have left those so-called counterparties holding an empty bag, and many would have probably followed Bear down the drain. And they could have dragged still others down. Aside from that direct effect, the blow to confidence would have been enormous, and without confidence, the financial markets just can’t operate. If Bank A doesn’t trust that Bank B is good for the money, it’s not going to trade with it. That would mean a freeze-up of normal business and consumer lending that would quickly throw the real economy into the tank. JP Morgan Chase is paying a notional $2 a share for Bear Stearns, a thirtieth of what it was worth less than a week before the takeover. But JP Morgan is also assuming the risk for some of Bear’s crappier assets, which could turn out to be worthless, or close to it. The Fed is offering JP Morgan $30 billion in guarantees against the worst, which may or may not ever be needed. In any case, so far the Fed has made mostly promises that have not yet been called on. So there hasn’t been any significant expenditure of public funds on this bailout, or any of the extraordinary measures that preceeded it in recent months. The Fed is one of those rare creatures that can print money out of thin air without getting arrested. In general, it doesn’t get any appropriations from Congress out of the federal budget. It’s self-financing, mainly because it buys Treasury bonds with the money it creates, and collects the interest payments on them. It deducts what it wants for expenses, and passes along what remains as profitabout $25 billion a year latelyto the Treasury. But it’s also extremely unlikely that this crisis will be resolved without the expenditure of real taxpayer money, and probably large gobs of it. Resolving the savings and loan crisis of the 1980s took about $200 billion of federal moneyamazingly, no one knows exactly how much; the equivalent today would be $400500 billion. In the early 1990s, Sweden spent about 2% of GDP resolving a very similar financial crisis; the U.S. equivalent of that would be close to $300 billion. Since the expenditure of public funds is probably inevitable, it would be very nice, if the public actually got something in returnthough the precedents for this are not encouraging. At the very least, the financial system badly needs to be re-regulated to prevent the sort of wild speculative adventures that have become routine in recent decades. Though Wall Street types will complain that that will hurt them, or assert that regulation is impossible, these claims should be studiously ignored. This whole boombustbailout cycle has gotten very wasteful and very dangerous. It would have been nice if the dot.com and Enron debacles had led to some sort of re-regulation, but they didn’t. This time around, the hangover is even worse than the last go-round. What might the next one look like without some sort of re-regulation. Some people in Washington are starting to talk about this, but without serious popular pressure, the measures are likely to be very mild stuff indeed. But it would also be nice to see some new institutions emerge out of the wreckage of the subprime adventure. Failed small banks and mortgage brokers could be turned into community development, nonporfit, and cooperative institutions. As was suggested in LBO #116, instead of foreclosing upon people who are behind on their mortgages, some public entity could acquire their houses and transform them into limited equity cooperatives. In such an arrangement, people can own their dwellings, but only sell them back to the co-op at a price reflecting improvements plus inflation but without any speculative gain. Occupants would continue to pay a mortgage, but a much smaller one, with the government picking up some of the writeoff, and banks absorbing some as well. That brings us to the next issue at hand: the housing problem itself. All the financial melodrama discussed above is a reflection of the fundamental underlying problem that people took on mortgages that they couldn’t afford to buy houses that are now declining in value. All the Fed’s gyrations cannot really resolve that fundamental problem. And it’s very unlikely that there’s much of anything that the government could do to change that either. As LBO has pointed out before, the housing boom that took off in the mid-1990s was totally unprecedented in U.S. economic history. According to Robert Shiller’s (very) long-term index, the housing market has experienced many ups and downs over the years, but most of the downs have undone much of the ups, which left prices in 1990 little different, after adjusting for inflation, from prices in 1890. 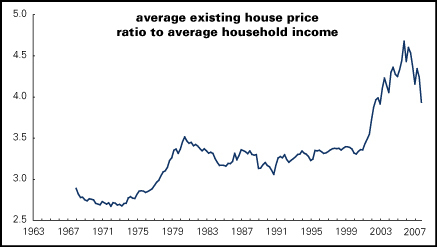 That changed around 1996, however, when prices went vertical, rising about 85% in real terms into their mid-2006 peak. They’re now down about 13% from that peak. In recent housing cycles, prices have given back about half the upswing’s gains, and lasted almost as long. That would suggest we’re only about a quarter of the way through the downcyclenot, of course that past performance is a guarantee of future results. Comparing house prices to houshold incomes also suggests there’s lots more to go. For a long time, the average house cost about three to four times the average houshold’s income (see nearby chart). During the bubble it got up to almost five times. We’ve come off those peaks a bit, but there’s still plenty more to go. There are two ways prices could come back into whack with incomes: either by falling another 17% from here, or going nowhere while incomes creep higher. (And since the economy of the next few years is likely to be pretty crappy, “creep” is an accurate word.). Assuming no change in house prices and slow growth in incomes of 3% (not adjusting for inflation), house prices should reach the average by mid-2009. To match the price/income ratio’s record low under the same assumptions would take until sometime in 2011. So either by time or price or both we’re not close to the end of this. And what about the immediate economic outlook? When the Fed cut rates by only 75, rather than the expected 100, basis points last Tuesday, its policy statement cited inflation risks in surprisingly stark terms. There’s no question that inflation is running higher than what the Fed would like, or what we’ve gotten used to in recent years: it’s now running at a 4% annual pace, more than twice what the Fed would probably like to see. Add inflation to stagnant growth and you’ve got something like a rebirth of that 1970s demon, stagflation. That stagflation, however, was driven in part by rising labor costs. The labor demon was slain by Paul Volcker and Ronald Reagan in the early 1980s, and has not yet come back to life. This time, the inflation is being driven by commodity pricesoil, obviously, but also metals, foods, and other base materials that the theorists of the New Economy thought we’d left behind. One of the driving forces behind these global inflationary pressures has been China, whose rapid growth has generated an insatiable demand for these basics of economic life. This is a remarkable change in China’s global economic influence. 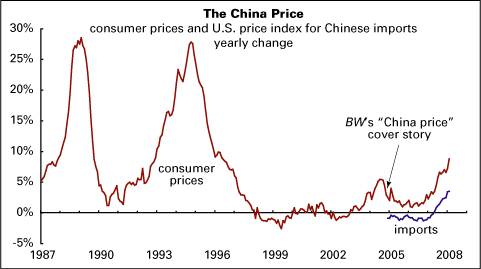 A few years ago, China seemed like a big deflationary force, driving down the prices of everything. That was the theme of a December 6, 2004, Business Week cover story called “The China Price.” The magazine’s cover line promoting the story within: “They are the three scariest words in U.S. industry. Cut your price at least 30% or lose your customers.” That effect hasn’t gone away, but as the nearby chart shows, Chinese pricesboth domestic consumer prices and the prices of their exports to the U.S.have turned markedly up from the days when they were flat or down, roughly from 1997 to 2005. In fact, BW’s cover came close to the end of that periodtiming reminiscent of their famous 1979 “death of equities” cover, in an issue dated three years to the day before the birth of the greatest sustained bull market in stocks in U.S. history. It may be that the commodity boom has been inflated by speculators, who’ve plunged into these markets when the prospects for financial assets were looking grim. There are some signs that those positions are being unwound, so all those inflationary pressures could soon be receding into history. But for now, the inflationary outlook greatly complicates the Fed’s rescue mission. As for growth, the leading indicators aren’t looking so good. The Conference Board’s venerable leading index is down five months running and its yearly rate of change is in the neighbhorhood it was in several months before the onset of the recessions of 1990 and 2001. It’s nowhere near as bad as it was, however, in the run-up to the nasty recessions of 197475 and 198182. 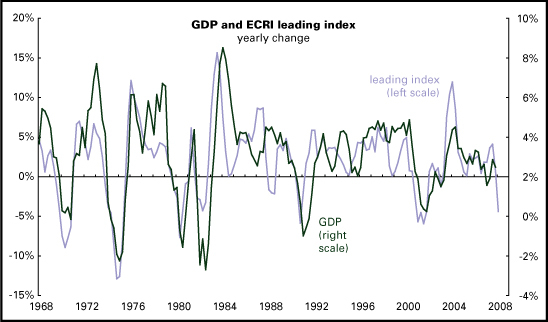 A less well known leading index produced by the Economic Cycles Research Institute is telling a similar story, as the nearby graph shows. So while many pundits are forecasting a deep recession, that’s not yet visible in the stats. Who knows; we may get there yet. This article will be updated and expanded in LBO #118. And the issue’s Money page will report on what the Fed and its siblings are up to, as it always does.